A few weeks ago, I was tired of the rainy, grey, city sky. I desperately wanted blue sky, crisp air, and plenty of snow. I longed to see mountains; and for that, I would have to go to the Tatra mountain range. It was a Wednesday in December, and Bratislava had received snowfall overnight. In the outskirts of the city, the snow lay deeply, but the town centre where I live never gets much. Any snow that settles by my house usually melts by noon. Reluctantly, I left for work that morning knowing the snow would be gone when I got home. Feeling miserable, I watched the thick snowflakes falling beyond the frosted windows of my classroom. My students were enjoying the snow outside, but I had lessons to prepare and papers to grade. 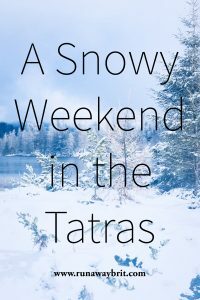 I decided I would convince friends to spend the weekend looking for snow in the Tatra mountains. One of the greatest things about living in Bratislava is the location. For regal European capital cities, Vienna, Budapest, and Prague are all easy to reach. I can fly to Greece in less than an hour if I want to go to the beach. If I want to bathe in a thermal lake, Hungary is just across the border, and I can go to the Austrian Alps to ski. However, Slovakia has many of these things too. And not so many people know about them. The Tatra mountains lie along the north of Slovakia and the south of Poland, forming a natural border between the two countries. 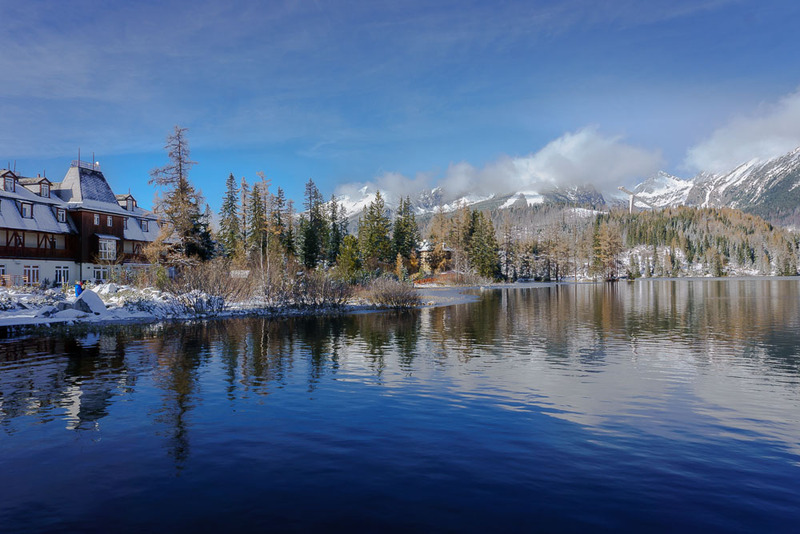 Here, you can find lakes, ski slopes, thermal spas, and plenty of snow. 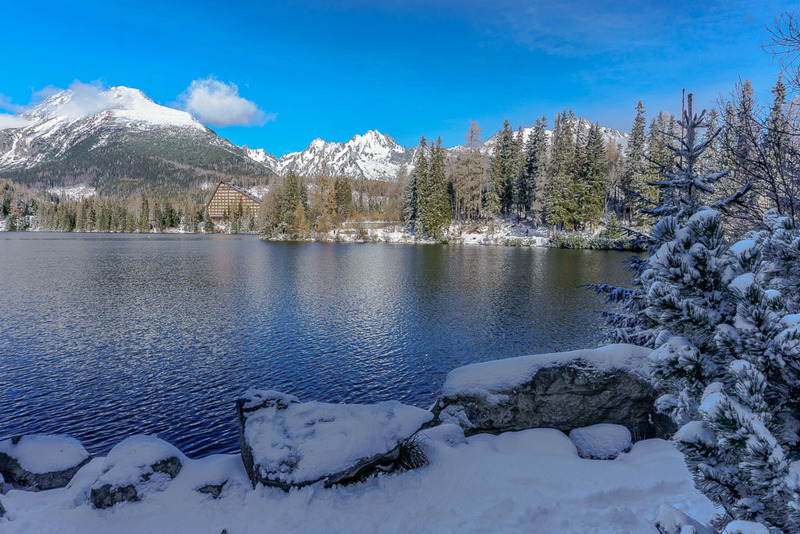 While the Tatras are not as impressive in height or range as the Alps, they are worth visiting. Best of all, they are an easy drive from Bratislava. We left Bratislava early on a crisp Saturday morning. The road to the Tatras is straightforward if a little boring. Approaching the mountains, the scenery becomes far more interesting as grassland turns to pine forest. Occasionally, the road passes through a snow-swept valley amongst which sits a castle atop a rocky crag. For people who don’t drive, the Tatras are also easily accessible by train. You can take an intercity express to Poprad in the foothills of the mountain range. Here you switch to a single-track, electric train that stops in each village. At times, the road runs alongside the train as it chugs up the mountainside. It looks like a scenic journey. Next time I visit the mountains, I will travel by train: it is easier to appreciate scenery when you’re not driving. We had booked an apartment in Tatranská Lomnica, where we hoped to take the cable car to the top of the mountain. Sadly, blizzards were blowing in, shrouding the summit in an impenetrable fog. Later that evening, we called in at a cheaply cheerful pizzeria, lured by the warmth of a log fire that burned brightly. After dinner, we spent the evening chatting and drinking prosecco in the hotel’s jacuzzi. It was the perfect way to spend our girls’ weekend away. 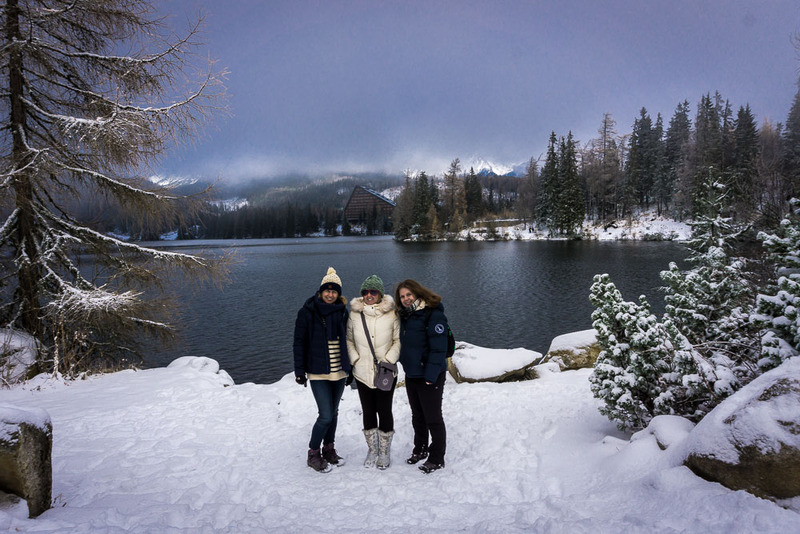 The following morning, we drove to Štrbské Pleso which is a gorgeous lake surrounded by mountains. The lake is popular with Nordic-style skiers, as well as with families and dog-walkers. By the time we arrived, thick clouds had descended over the lake, obscuring the view in mist. Fortunately, there is a lakeside restaurant which boasts an extensive hot chocolate menu. We hadn’t been there for long when the clouds parted, revealing snowy mountain peaks that reflected perfectly in the lake. 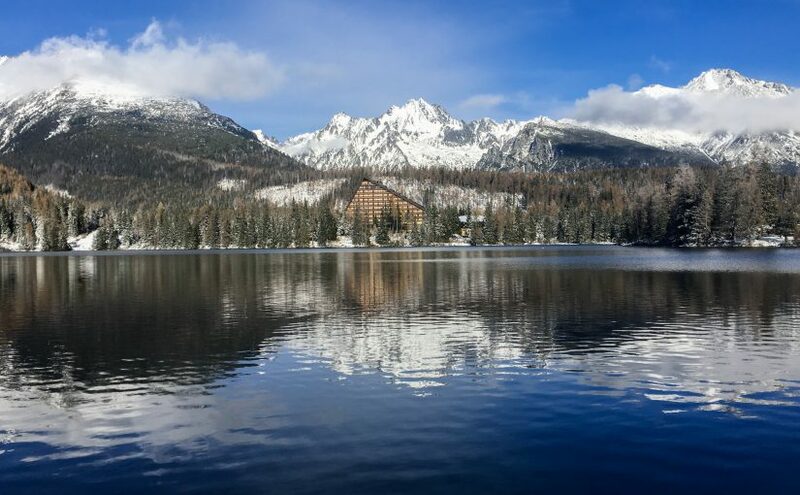 Štrbské Pleso may only be a small lake and the Tatras are only a fraction of the size of more well-known mountain ranges, but it is a gorgeous little place that is not too far away. For me, it is perfect. 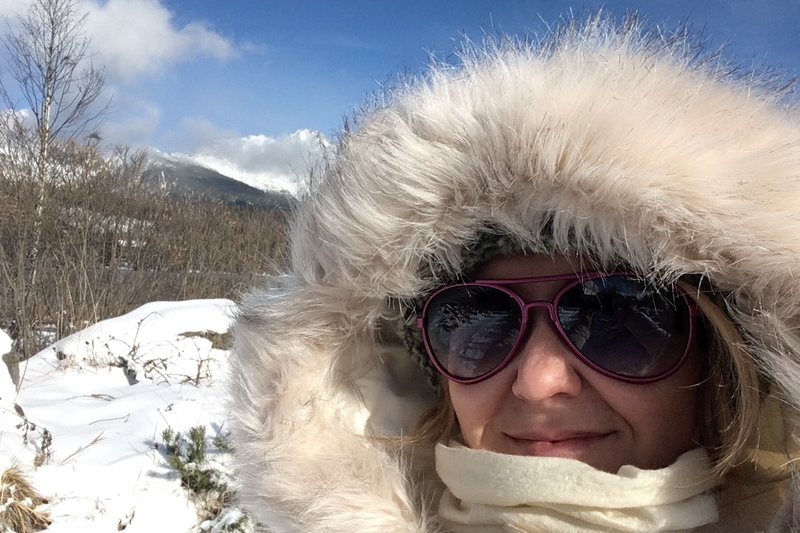 My New Year’s Resolution for 2018 is to blog more often, so watch out for more Slovakia posts! Have you been to Slovakia? If you have any recommendations for me, then I’d love to hear them! Let me know in the comments. Those photographs are absolutely beautiful and I’m glad you managed to get away and cheer yourself up!